We were ripe to fall in love with Lisbon. It had been almost a month since we left Seville, our last significant city, and we longed to be swept off of our feet by a grand dame. 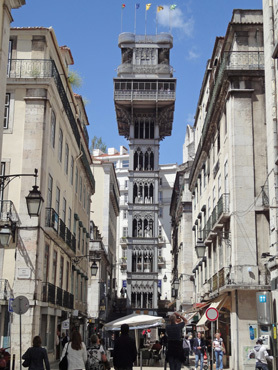 The Portugal we'd seen to date was often 1-2 stories high and rustic, except for package tourism high-rises. The museums were all freshly renovated, but pocket-sized. We were ready for a spring fling in a big city after weeks away from anything stunning or fetching; we were expecting raptures in the capital city of 600,000 with another 2.6 million people in the surrounding area. 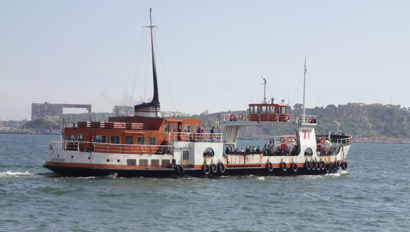 A less-than-glamorous ferry carried us to Lisbon. After triumphing over the many road and traffic hazards to arrive at her feet, we were happy to make our entrance to the country's largest city on a ferry. But unlike most of the sleek ferries we'd boarded with our bikes, Lisbon sent out what looked like an old trawler to greet us. The 'barca' had widely spaced wooden slants for decking that made maneuvering our loaded bikes especially difficult. Debarking at the port, we re-gathered our dignity to formally greet Lisbon but were confronted with more narrow cobbled lanes and a construction project. Instead of experiencing an exuberant embrace, we steeled ourselves and headed into the city core, once more hoping to survive the test of nerves before the love affair began. Fortunately one length of the road construction project was idle, giving us a de facto bike lane and another chance to feel like the welcome mat was out. Our first look at Lisbon was from the ferry. We felt like Lisbon winked at us when we emerged from the broken concrete and were dazzled by the formal Praça do Comercio: a huge open plaza with a giant bronze statue of a king on horseback in the middle and stately old buildings on 3 sides. Lisbon had the same enchanting, bold relationship to the sea like Venice; Barcelona; Split, Croatia; and Trieste, Italy. Well, technically the plaza fronted the bay-like Rio Tejo, but it felt like we were on the sea that was only minutes away. Yes, we were in love with Lisbon. This was what we longed for. We wanted to forget the rough treatment on the roads and be engaged by the civility of the city. We pushed our bikes across the expanse of the plaza; walked under the huge, towering marble arch; and promenaded with the crowds on the busy pedestrian street. Scattered bits of delightful architectural elements, both old and new, turned our heads and reminded us of the visual fun of Barcelona and Prague. Dignified and traditional; bold and experimental, though not always successful; the edifices added visual interest all around town. The old wrought iron elevator tower still turns heads. But after a brief, captivating encounter, Lisbon again gave us the cold shoulder when she threw us out into the traffic, back out into the mix with the difficult Portuguese drivers who seemed to totally lack in creative responses when things got tight. Fast and faster seem to be their limited menu in traffic, with slowing or 'going around' being the remotest of strategies. Like out on the highways, we had another terrifying ride, with Lisbon seeming to be indifferent to us surviving as a suitor. Totally depleted and discouraged, we crammed ourselves and our bikes in a too-small hotel room we'd reserved for the night. The next day we were out, on foot, in search of another hotel. We'd stopped at a tourist info kiosk on the pedestrian mall the night before and discovered that the Pope was due in town in a few days. The day before we'd gotten a heads-up that he would in Fatima, 50 miles or so to the north, but we'd been reassured that he wouldn't be in Lisbon. Wrong, wrong, wrong, like so much of the information we got over the next week about the Pope's visit. Had ours been a normal overseas bike trip of a week or 2, the Pope's visit to Lisbon, Fatima, and Porto would have been a disaster. We only learned of it when a day's ride out of Lisbon and were told that his visit to Fatima wouldn't affect Lisbon at all. Prices for hotel rooms in some towns along his route bumped from under $100/night to $450/night. Parts of the Lisbon's metro system were shut down, there was a special holiday declared for his visit that would close an unknown number of services and on and on. Our outrage at the Pope's recent lack-of-handling of the priest pedophilia issue made being inconvenienced by his visit even more annoying. 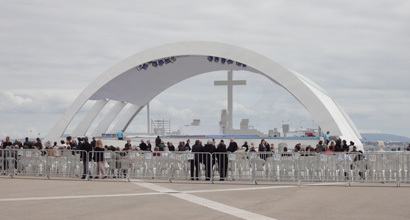 The Pope's canopy was being installed on the main plaza. We added a day to our Lisbon stay with each new bit of information about the Pope's Portugal visit, increasing the need for a more comfortable room. Our first sightseeing day in Lisbon was consumed with shopping for and relocating to a more gracious hotel though it wasn't as well located for sightseeing as our initial selection. The agitation we so often felt when out on the streets in Lisbon increased our need for more soothing interior space for our longer than expected stay. Our newly remodeled hotel room was lovely and the staff were delightful but in our first minutes in the room we unwittingly ran up a $10 bill by removing 4 small bottles of water from the refrigerator to stash our bag of carrots. Only after the sensors had been activated by the removal of the bottles did we notice the sign that also mentioned that it was not possible to reverse the charges. Bill rushed down to the desk to beg for forgiveness and the desk clerk kindly credited our account. Like when out on the streets, we had a hard time hitting it off with Lisbon even in the privacy of our room. 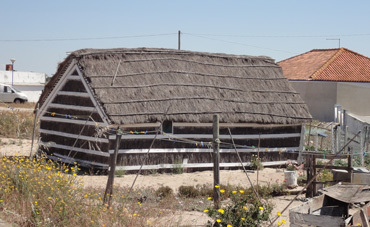 Fortunately we weren't staying in traditional coastal lodging. The good news about the Pope's Lisbon visit was that the preparations included blocking off many streets the day before his arrival, giving us safe passage here and there as we used our bikes for a day of sightseeing on the perimeter of the city. The police gave us the nod to ride on the scattering of closed roads but it was still very dangerous, trying riding. We had hoped to 'connect the dots' with the bike lanes we'd spotted but discovered that most only ran for short distances. Though short, some of the bike lanes had a thick, smooth surface applied over a swathe of the cobblestone sidewalks that was striped for bikes. I was a bit annoyed but even more amused as to how these red, designated bike paths were magnets for pedestrians. We even found ourselves walking in the middle of the first one we encountered--like everyone else, we instinctively moved off of the uneven, slick cobbles onto to smooth bike lane. It wasn't easy to dislodge pedestrians from our rightful path when on the bikes and we had the added hazard of getting accidently spit upon by runners that we overtook on our path. Biking in Lisbon was a loser and being a pedestrian wasn't much better. In the smaller cities the Portuguese drivers generally yielded to pedestrians at crosswalks but even a green walk light in Lisbon did little to shield a walker. A crosswalk and a green light gave odds of safe passage to a person on foot that were only slightly better than winning with a lottery ticket. The nostalgic trams were often way behind schedule. We also found the public transportation system trying to use as first timers. The info person at the train window deflected us to the metro window, who deflected us to stand on the sidewalk "out there" where we were to wait for an unidentified bus. That day we finally settled on the metro and spent about 2 hours getting from our hotel to the cluster of museums we'd targeted. Our metro map wasn't up to date; we never found a route guide for the buses; and the expensive trams didn't seem to run on schedule (sometimes 4 of them on a single route would be bunched together). 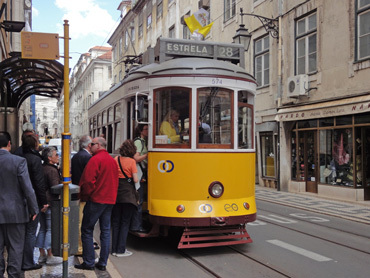 Public transportation was frustratingly difficult; biking was too dangerous; and the distances were too great to walk between major tourist sites--once again, Lisbon was making it hard to love her. We are museum nerds and had been enchanted by the unusual twist on story-telling we discovered in the tiny museums in the south, in the Algarve. Part of our anticipation of Lisbon was to disappear into museum after museum to learn more about Portugal. We spent one full evening reading about the various museums and sights; locating the sights on our maps; and prioritizing them for visiting. But we were again disappointed--we hadn't for a moment imagined that showy Lisbon could fall so short of our expectations in telling her story in the many museums. 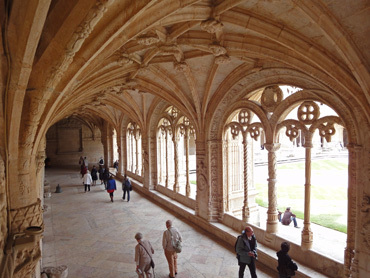 Given that Lisbon is a city which traces her roots back to the Phoenicians and was rebuilt from rubble after the 1755 earthquake that leveled Roman ruins as far away as in Morocco, there were many stories that could have been told that weren't. The monastery cloisters were indeed grand. Portuguese mariners were the front runners in the Age of Discovery, beginning with their voyages early in the 1400's, and yet Lisbon failed to capitalize on her boasting rights. The maritime museum was filled with fine detailed models of ships but fell far short of captivating visitors with the stunning accomplishments of Portuguese mariners. Nowhere in the Maritime Museum did the visitor get a sense about the process the mariners went through in wooing monarchs to finance their voyages or what life was like on those incredibly small craft or what percentage of the explorers were lost at sea or how the discoveries affected life back home. Vasco de Gama has a bridge named after him and there are numerous nautical motifs around the city but why didn't the museum tell the bigger story and in depth? About a third of the small archeology museum was of Egyptian relics--a great topic but we would rather have learned about Portugal. And curiously, the most interesting piece we learned in Lisbon about Portugal's 20th century history was from the Fado Museum--a museum about a single musical style--and not the museum of the city's history. The difficulty in using the transportation to maneuver between the widely dispersed tourist sights and the disruptions caused by the Pope's visit unceremoniously whacked museums off of our list but it was hard to believe that any would have wowed us after the broad sampling we did make. 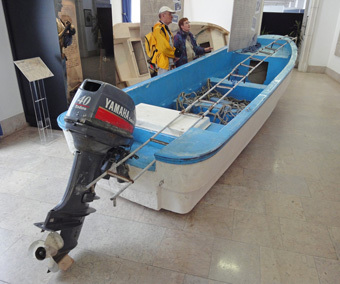 Maritime Museum: A safe way to see a Somali pirate boat. When we were poised to leave the city the day after the Pope's departure, we felt like spurned lovers. We came ready to love Lisbon, to extol her virtues to many friends for years to come but we left ambivalent. Time will tell how she fairs in our memories but our most potent remembrances of our extended stay in Lisbon may be what we saw on TV over those many evenings. Our time in Lisbon coincided with the Dow's 'flash crash' in which it dropped about a 1000 points in 10 minutes; the Euro tanking towards 4 year lows; Angela Merkel loosing her power base in Germany in part because of supporting the EU/IMF bail-out for Greece; the UK being in a massive stir about its hung parliament; and the second round of European airport closures due to Iceland's volcanic ash. A family emergency had us staying in Lisbon for another week after the Pope's departure so as to remain involved and available. While people back home were sleeping, we made a day trip to Sintra by train to visit a 9th c Moorish castle and one of those playhouse castles of the rich and famous built in the 1840's. We also lowered our expectations and visited several more museums; walked long distances between a number of green spaces; and discovered that the nearby zoo had a large garden area in which we could picnic in for free, which we thoroughly enjoyed. 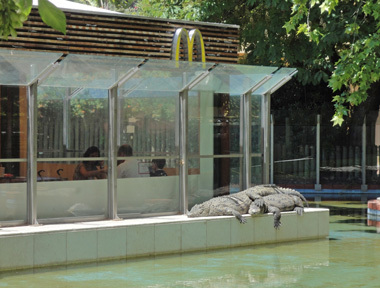 Our prolonged, horrified laughter provoked by seeing crocodiles sunning themselves against the glass wall of the zoo's McDonald's was a wonderful antidote to the serious business that extended our stay in the city. That sight is on its way to being my favorite image for 2010. Lisbon Zoo: crocodiles sunning on McDonald's pad. Portugal is lovely but we've been disappointed to still be rallying all of our biking skills to stay alive on the roads. But maybe, just maybe, our luck is turning with the drivers as yesterday was our first mostly pleasurable day on the roads of Portugal. We've been having "risk management" discussions and are considering bailing on Portugal if we continue to have daily close calls.